What better outline of a beautiful pan of steaming baked potatoes and crispy outside but soft-hearted? Unfortunately, potatoes often come out of the oven so well cooked but unfortunately soggy; or worse, scorched and inedible. I have been adopting two-stroke cooking for many years. Two-stroke because in this preparation baking is preceded by a short cooking in boiling water. This technique allows, in addition to halving the cooking time in the oven, also to make the potato surface free from starch and therefore more susceptible to the formation of a crispy crust. 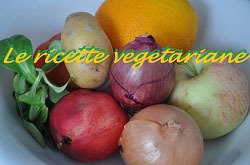 Here the quantities are left to the appetite of those who cook and the size of the pan that will be used. Meanwhile, clean and peel the potatoes. Personally I prefer to use whenever possible new potatoes with a little thick peel and cook them with the peel after having thoroughly cleaned with a brush or with special gloves to clean vegetables (also fantastic for carrots, among other things ). Cut lengthwise into four segments and, if desired, halve. Salt the boiling water and cook the potatoes for two minutes from when it starts boiling again. Then drain well and dry them on a cloth. 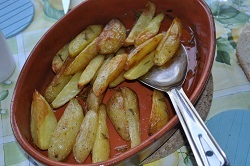 Preheat the oven (static) to 230 °, pour the olive oil in a baking pan and mix the potatoes. Season with a sprig of chopped rosemary and very little salt (they have already absorbed during the short cooking in water). As soon as the oven is at temperature, put the potatoes in the oven, lower the oven to 200 ° and cook for 30 'without turning or opening the oven. The potatoes are ready to be served! For potatoes that are even more crispy from the outside, absolutely avoid adding salt when baking. Instead of rosemary you can use other spices, for example oregano (in my house is omnipresent). A whole clove of garlic, in the pan, gives a touch of extra aroma.